Do you have a go to recipe that you make when you can’t think of anything else you want? When I was growing up it was stir fry. We ate stir fry a lot and now that I’m a mom myself, I see why my mom made it so much. I love meals that take one, maybe 2 pots and that’s it. Something you can just open the fridge and think, “What vegetables need to be used before they go bad?” or if you want quick and easy clean up you can use a mixture of frozen veggies. I also love meals where the focus can be vegetables and it’s one of the easiest ways to get the picky kids to eat their veggies. At least that’s my experience. The main character in this stir fry recipe is the Peanut Sauce. Feel free to mix and match meats and veggies to suit your family and what needs to be used from your fridge. In a small sauce pan, whisk together all ingredients and gently heat enough to blend ingredients well. 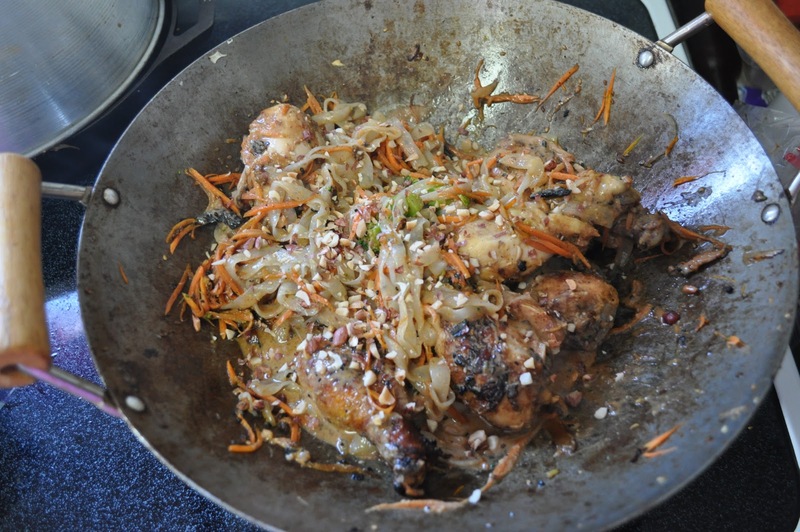 In a wok or over-sized cast iron skillet, melt coconut oil and saute chicken until it is cooked through. Remove chicken from pan and cover to keep warm. Saute sesame seeds, cloves and onions in the wok. When onions are transparent, add carrots and broccoli. Cook until broccoli is bright green and still slightly crispy. Add chicken and top with peanut sauce and crushed peanuts. Serve on top of shirataki noodles or rice. Made this recipe a few nights ago. My 2 kids absolutely loved it and ate a lot! So thank you for that! For me, the sauce was actually a little too peanut-y, even after adding a little more of the other liquids. I used organic peanut butter.